Home » Animal Welfare » Conformation Critique » Breeding quality? Feel free to critique. I am seeing certain flaws and wonder if others see them. 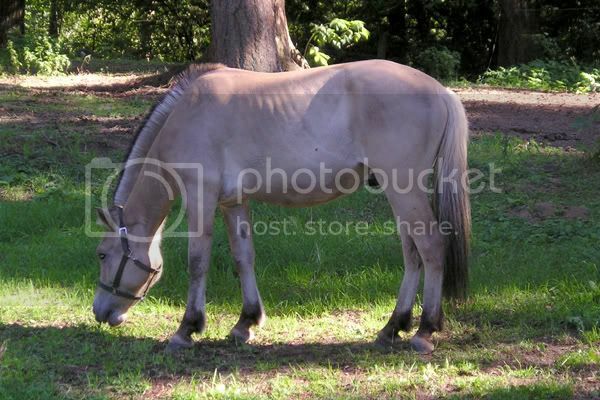 Weird, it's that same low, low, low set tail that Maggie had (Haflinger, for those who don't remember). Are draft ponies supposed to have that? Ok, but take it with a grain of salt! There's something about his eye I don't care for but can't place it and something about his head overall that just doesn't grab me. He seems a bit thick through the throatlatch and neck, but that is likely characteristic of the breed. His shoulder is STRAIGHT. His humerus is short and quite angled. He's borderline back at the knee, but he isn't, so I'd call him flat kneed. Not really a fault IMO, just something to watch for when breeding. His back and barrel seem fine to me. His croup is VERY steep and his tail set VERY low. For some reason I feel like he's a bit camped out (I think the angle of the photo is slightly misleading), or possibly a tiny bit sickle hocked, but it's probably minor if he is. I think he's a bit upright in the hind pasterns, but they're quite short so that's not all that surprising. That's what I see. Overall he just doesn't grab me. FWIW if these horses were bred to pull (Haflingers included) then the straight shoulders, steep croups and low tail sets kinda go along with that from what I've seen. He is five in the photos in the first post. I still see the same things with two small exceptions: his croup doesn't appear to be as steep as it looked (odd because I don't generally find photo angles changes that a great deal), he is much more attractive overall. I guess the clean and sleek coat and being in a much more appropriate weight really help his overall appearance. But in reality, it doesn't change much. So, when are you going to tell us what's the deal with him? The things I don't like the most are the thick throat and the low set tail but I'm biased toward the light, riding-type horses. The shoulder, I understand, is desirable for the breed? Other than that he's cute but doesn't scream "breed me!" I don't know the breed well but I've seen other Fjords with more presence. We got him as a stud colt and promptly gelded him. 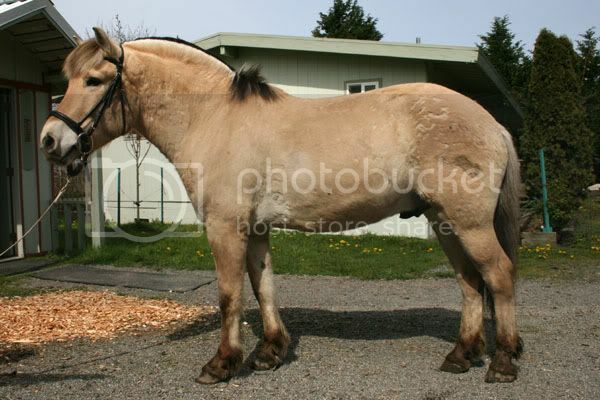 As bad as it sounds, it was lucky he was too underweight to breed because she had him turned out in a field full of mares, mostly grade, to try and breed fjord crosses. What I was wondering is what is going on with his back. In person, he is terribly roach backed. It is like his back grew up rather than out as he got older. I saw him for the first time in quite awhile and was shocked as I hadn't remembered him being so roached. I think I did a decent job hiding the roach with my camera angle (not on purpose :rofl ), but it shows that it can be done :lol:. Another fjord of ours didn't finish growing until he was about 7 so who knows if he'll straighten out, but I am sure glad that we castrated him before he managed to procreate. Also, his head got huge! I have never seen a horse grow so strangely. 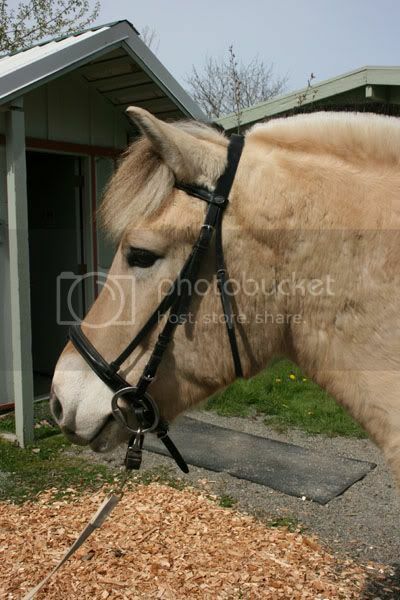 In the first photos, he is wearing the only english bridle we have that will fit him. He shares it with our 16hh fjord draft cross (pictured standing next to a normally proportioned Fjord). I see the roach now in the trotting shot. I assume he has been chiropracted/massaged/acupunctured? Yes (chiropractic/massage...no acupuncture until I get certified :D ), and he was also started very slowly and only just this fall began in classes with only intermediate/advanced riders. I completely agree about his head. But I have to ask... are you sure he's roached and not just very steep crouped (and probably downhill)? 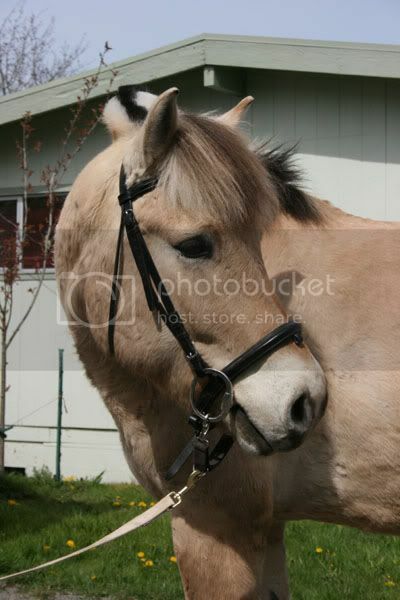 His head to me is typical Fjord, plain and a little coarse - as the premitive breeds should be. His back does looked roached in the trotting shot but not anything I would worry about, I actually did know of a young Fjord colt that was bought and developed a rather noticeable roach to his back and he could not be ridden at all. do some acupressure until you get certified to do the acupuncture ;) I took equine acupressure courses in college through Tallgrass Animal(who works with the college I went to) and do it on a regular basis. My girls loooove it, especially when I work it in with their massages. The neck (thickness, that it's short and how it ties in up top, and below), shoulder, low tail set, slight roached back (visible in just the trotting shot to me) would steer me away from breeding him. I like me an "overall pretty picture" and while he is an adorable pony, he just doesn't look breeding quality to me. He may not be stallion quality, but I actually like him! I think he's cute haha! I love the 3 year old pic! 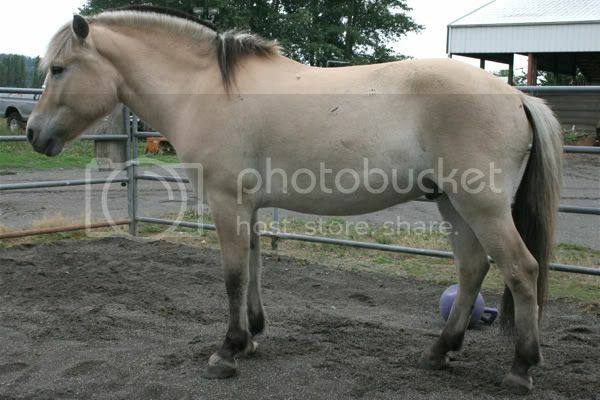 I always wanted a Fjord....Really neat looking horses. oh my gosh one of my students wants a Fjord too. She saw one at a show and fell in love... not to ride, but just for a pet I guess. Noooooooooo! I told her absolutely no. 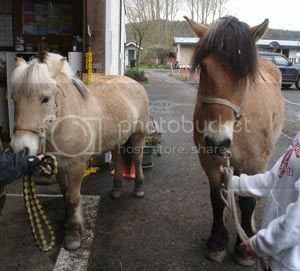 I get twitchy just thinking of the Haflinger that used to be here and have put my foot down. NO DRAFT PONIES IN THE BARN. 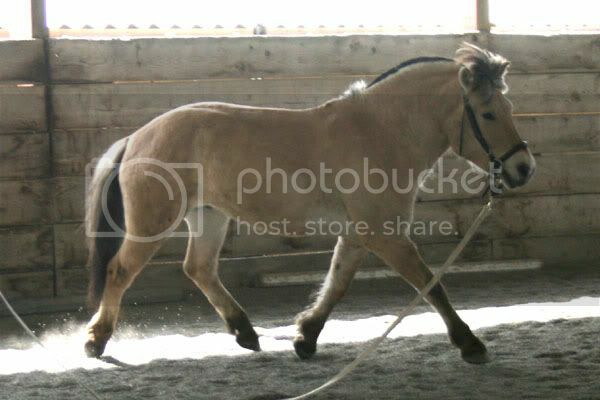 I want a Fjord to ride. I have two friends, one has a Fjord, one has a Haffie, they both do dressage, jumping, etc. Versatile and tough little cookies. Neat horses. *shrug* Some people get along with draft types. I absolutely don't. Currently I have a flaxen chestnut (think: Haflinger-colored) Welsh Section C (even she is cobbier than I like, really) in Maggie's old stall and sometimes I catch a glimpse of her out of the corner of my eye and think "Maggie" and my heart sinks. I will never agree to train one again! It's our differences that keep the horse world interesting I guess. I can't say whether she was good or bad in general terms, just really not my kind of horse. My dressage/eventing friend visited and rode her and actually liked her. She warned me that I needed to get her gone very soon as it was obvious that I hated her. Luckily she sold about two weeks after that. I have ridden hundreds of horses and she was hands-down my least favorite ride ever. *shrug* Some people get along with draft types. I absolutely don't.